It’s always good to get heard – and now you can bring those rock n’ roll classics to life with this retro Rockabilly Microphone Speaker! Just plug in your phone or mp3 player and you’ll be tapping your feet to the beat in no time. You can croon around your room or listen whilst on the go, enjoy all your favourite music: loud, clear and amplified. This mini speaker packs a punch with a 2000 milliwatt output power speaker, delivering optimal sound quality in your home or on the go. And no need to worry about batteries as our microphone speaker features a 250mAh lithium ion battery, which can be recharged from any computer via the provided USB cable. 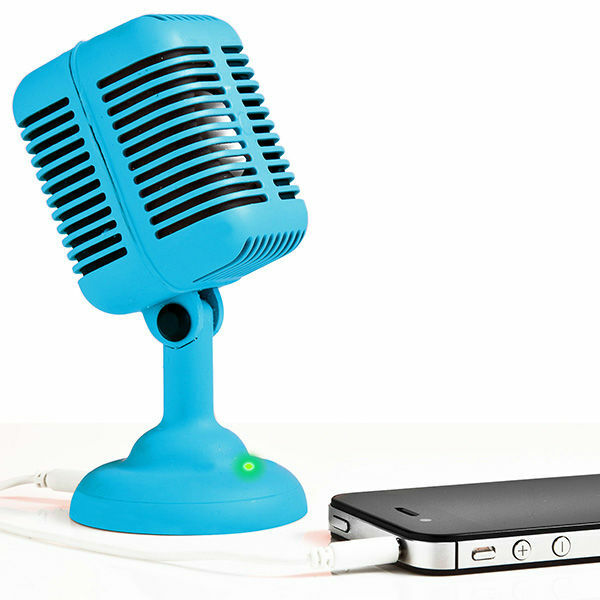 So go on, give it a retro rock and roll boost with the portable Rockabilly Microphone Speaker. Get your jive on.